Manual layout of the holes. Use magnetic drills to generate holes at one end of the girder. Bolt up the connection plates. Bring the next girder in the line and manually position it to the girder that now has the connection holes drilled and connection plate bolted into position. Once the two girders are properly aligned, manually drill the connection holes at the one end of the second girder. Once the connection holes are made in the one end of girder #2, remove girder #1. Move girder #2 to the previous position of girder #1. Proceed to manually layout the second end of girder #2. After drilling the second end of girder #2 and bolting on the connection plates, manually position girder #3. Continue the process described above for the remainder of the girders in the bridge. As one can imagine, the above process commits tremendous shop space and up to 50+ man-hours for each connection. This traditional method of bridge girder fabrication has historically represented the universal practice in bridge shops around the world. No machine tool builder had even considered to attack this process with a more productive solution until FICEP accepted the challenge in 2009. This challenge to implement new technology is indicative of FICEP’s commitment to drive innovation. Currently, FICEP offers the only solution to automate this process and eliminate the manual labor associated with girder fabrication. How did FICEP do it? As part of the task was to reduce the shop space required and girders can extend up to 50meters (150+ ft.), they engineered a gantry solution. 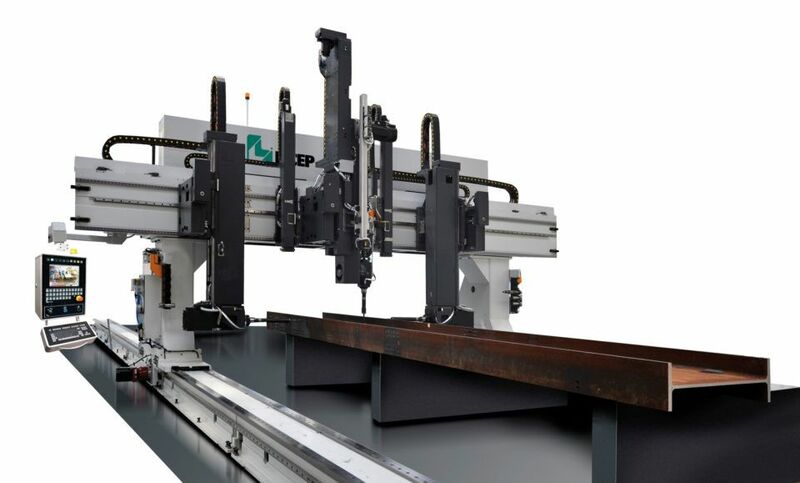 As the girder remains stationary and the drill moves, this approach reduced the total length of the CNC system to essentially the length of the maximum girder to be processed. Girders are engineered typically with extensive camber and sweep plus they are not always dimensioned as drawn. The FICEP girder gantry drill does not have a machine datum so it is not necessary to try to manually position a 50 meter (150 ft.) long girder up to some mechanical zero points. Once the CNC process is initiated, laser technology is used to probe the physical locations of the entire girder so the software can establish the required zero points. As there is a tolerance associated with the girder after welding the zero points that are established are unique to each specific girder that is to be processed. After the laser scanning cycle is completed, the three-spindle gantry drill starts to drill the required holes based upon the physical locations of the established zero points of the specific girder that is being processed. More often than not, holes in the flanges and the web do not share the same length coordinates as the web holes are generally skewed, for example, so each web hole has a different length coordinate. Even if holes share the same length coordinate in two of the surfaces, the girder is probably not positioned parallel to the travel of the gantry. 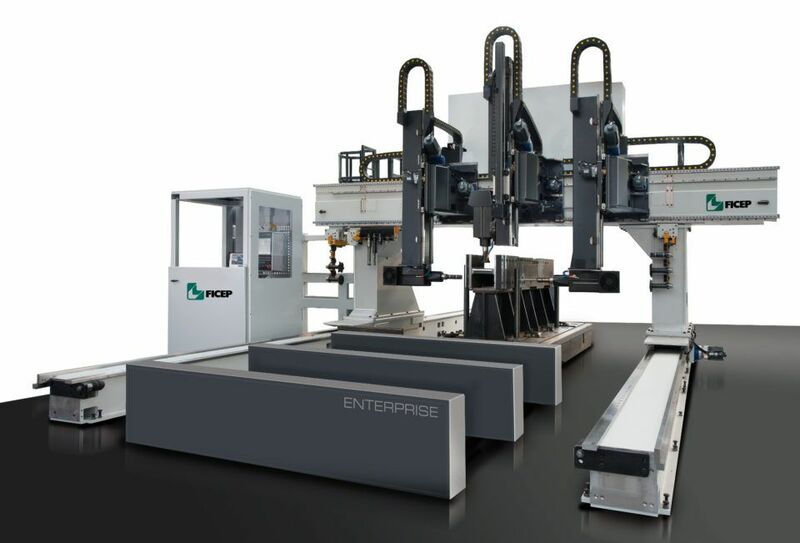 In order to increase the productivity of the Enterprise girder gantry drill, FICEP’s unique solution was for each spindle to have its own sub axis. This design permits the gantry drill to generate holes in all three faces of the girder even if the holes are not aligned. 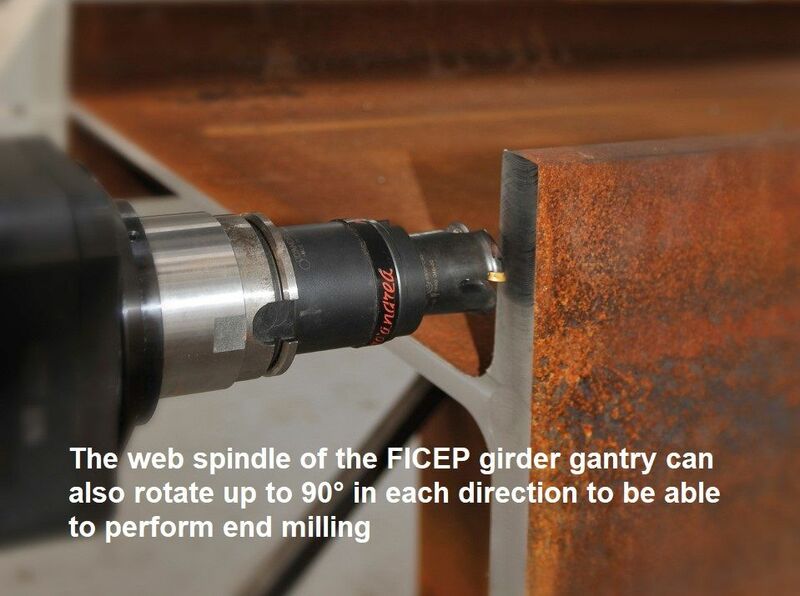 The web spindle of the FICEP girder gantry can also rotate up to 90° in each direction to be able to perform end milling. 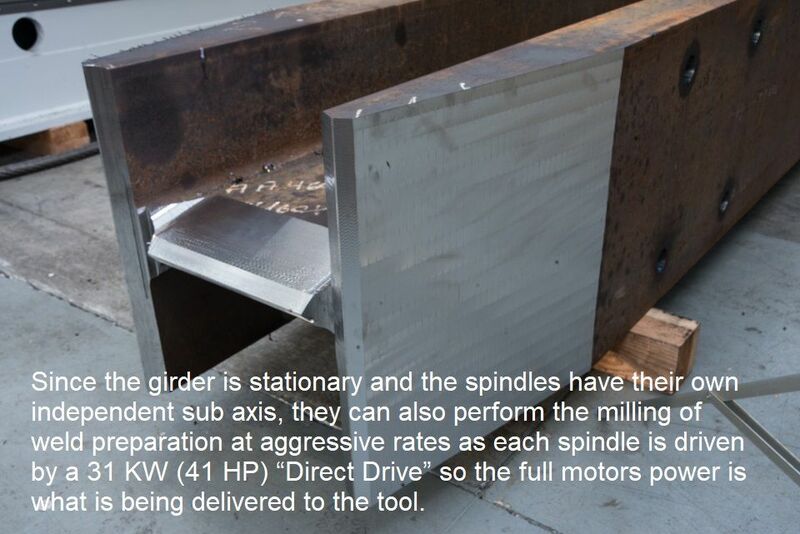 Since the girder is stationary and the spindles have their own independent sub axis, they can also perform the milling of weld preparation at aggressive rates as each spindle is driven by a 31 KW (41 HP) “Direct Drive” so the full motors power is what is being delivered to the tool. There is no loss of power as this is “Direct Drive” and it does not require a gearbox that diminishes the power delivered to the tool. The extremely large processing envelop, in conjunction with not having a fixed datum, permits large unique weldments to be laser probed and processed. The Enterprise Girder Gantry drill represents another innovative FICEP first to assist our business partners compete with alternative materials such as concrete.